Once upon a time, Apple was known for excellence not only in hardware, but in its software as well. These days, with it taking months for major versions of both iOS and Mac OS X to have their major kinks ironed out, you could be forgiven for thinking that we are going mad, but alas, it was once true. Things may not be as bad as they seem, but right now confidence in Apple’s updates seems to be at an all-time low. Take the recently released iOS 8.4 update as an example. Housing Apple Music and other new feature changes for the first time, the new software was eagerly downloaded and installed on iPhones and iPads around the globe. Unfortunately however, some people have been experiencing issues with the software, with complaints all over Apple Support forums and even some of the commenters here at RP are having the issue. The affected devices have been struggling to establish a GPS signal when using apps like Apple Maps, Google Maps, Waze and many more. The issue is larger than just the usual turn-by-turn navigation worries too, with many apps these days relying on a mixture of GPS and WiFi hotspots in order to pinpoint where you are. So, with GPS so integral to our daily lives these days, what can we do to try and make everything work just fine again? Well, there are three potential options:. 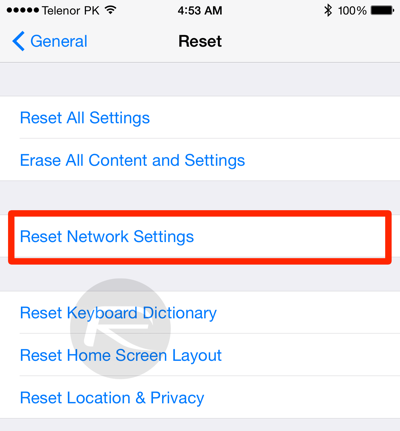 Head on over to the Settings app, followed by General > Reset > Reset Network Settings. This will, as the name might suggest, reset all of your WiFi passwords and network related settings, but it might be worth it in the long run. This is a bit tricky, so follow the steps outlined below as they are to make it work perfectly. Head over to Settings > Privacy > Location Services and toggle the switch OFF. With the switch toggled off, restart your iPhone. 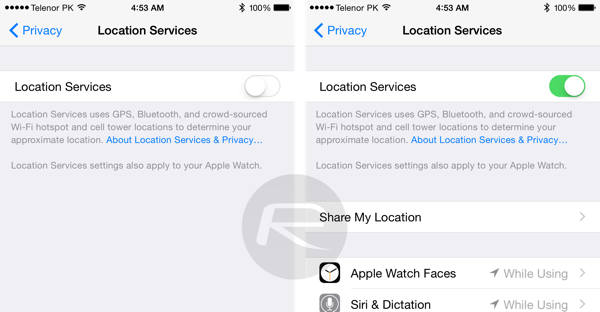 Now go back to Settings > Privacy > Location Services once again and toggle the switch ON. The nuclear option and a last resort, if all else fails then make sure that you have backed up everything via iTunes or iCloud and then restore fresh to iOS 8.4 using iTunes. 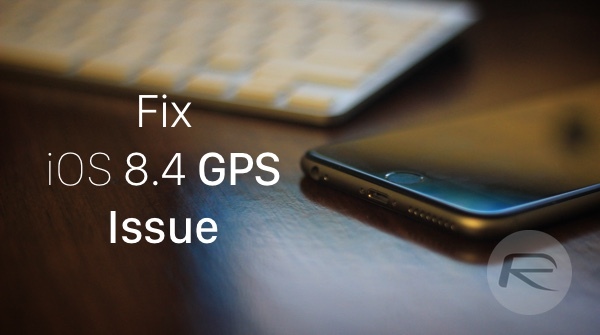 Sure, you’ll need to wait for everything to be sucked back onto your iPhone if you then choose to restore from a backup, or start completely afresh if you don’t, but it may just sort your GPS problem out. You can download the iOS 8.4 update from here: Download iOS 8.4 Final IPSW Links For iPhone And iPad. Why is this happening exactly is anybody’s guess at this point, the likely culprit seems to be OTA update. Good luck, and we look forwarded to your perfectly GPS tagged replies to tell us it all works fine! Thank you RP for posting this!! I posted a few comments about my problems on 8.4 a couple of days ogo on RP. Did a fresh install of 8.4 with my 6 Plus & 4S and Apple Maps would no longer work using 4G or LTE!! (Couldn’t access the internet) Would work on WIFI only. Googled it and my other people had the same issue. Rolled back to iOS 8.3 and now maps work on both phones again…. Scratch that I got the same issue cause I didn’t know about it til now. But I did the second method and it seemed to fix the issue. Yeah. Turning location services off -> reboot -> location services on did the trick for me as well. Second method (location services off -> reboot -> location services on) seems to have done the trick for me. Not Really. Works fine with me. I Haven’t had any lags and actually my battery is better on my iPhone 6 Plus maybe its just your phone. And The music app is pretty cool but not better than spotify but ill take 3 months for free. I have noticed some slight lag…double click home and folders do it too. I’m one of the lucky ones to not have any issues here with ios8.4 iphone 6 Fido carrier settings in Canada. Zero GPS problems with iOS 8.4, with maps, weather, turn-by-turn.. I don’t think it has anything to do with iOS 8.4 but more with some crap applications installed on the iPhone. If you update using iTunes , and not OTA, the installation process will be like format/clean install. I did a fresh restore, not update on both of my 6 Plus and 4S and had the issue, zero apps installed and no jailbreak. Plus, I used iTunes to do it and not OTA. May be an AT&T issue in different parts of the U.S. Northern Indiana here…. Noticed 8.4 lags a bit when switching between apps on my iPad. I’ll be downgrading to 8.3 asap. Nothing to do with lucky. Luck is just superstitious. Good time guys! I have tested some fraud site for equally of my and my gilfriends telephone unlｏck oh, jesus these were therefore unprofessional, took them two weeks to factory unlｏck my telephones as opposed to the 2 days, even one of my iphone was still not revealed yet. Anybody may confirm that ATTIPHONEUNLｏCKING. (cｏm) is really that good? I noticed may possibly achievement experiences together allready. Hold on with unprofessional unｌｏckers and free unｌｏcks. Recently I’ve got and unｌｏck my sons iphone 5S trough e-bay, i was utilizing it for nearly a month and no issues but then when i just been on a business tripit’s been suddenly blocked by the provider. First i did not know what to do I’ve attempted to fully unｌｏck after more but it was impossible once its locked back it’s not possible to unｌｏck it again, they said. My friend claimed unｌｏcking at ATTIPHONEUNｌｏCKING. [cｏm] is the best. Can you confirm this?